the graphs of linear inequalities. A linear equation is graphed as a line whereas a linear inequality is graphed as a line and a shaded region. 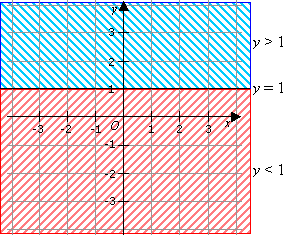 the inequality y ≥ 1 is represented by the line y = 1 and the points above the line (the blue area). the inequality y ≤ 1 is represented by the line y = 1 and the points below the line (the red area). Step 1: Rewrite the inequality as an equation. Draw the line that represents the equation. (Review Graphing Linear Equations if necessary.) Draw a solid line if the inequality is ≤ or ≥. Draw a dashed line if the inequality is < or >. Step 2: Pick a point NOT on the line and substitute in the x and y values of the point into the inequality. If the point makes the inequality true, shade that side of the line. If the point makes the inequality false, shade the opposite side of the line. We will revise the method for drawing a straight line using slope-intercept form. Rewrite the equation in the form y = mx + b. From the equation m will be the gradient and b will be the y-intercept. If the inequality is ≤ or ≥ then we draw a solid line. If the inequality is < or > then we draw a dotted line. Since the given inequality is ≥, we draw a solid line. After drawing the line, we need to shade the region. We pick a point not on the line, for example (0, 0). We substitute (0, 0) into the inequality 2x – 3y ≥ 6 and finds that it is false. So, we shade the opposite side of the line. The following diagram shows how to graph the linear inequality 2x - 3y ≥ 6. Scroll down the page for more examples of graphing linear inequalities. Rewrite the equation, x + y = 1, in the form y = mx + b. We need to draw a dotted line because the inequality is >. After drawing the dotted line, we need to shade the region. We pick a point not on the line, for example (0, 0). We substitute (0, 0) into the inequality x + y > 1 and finds that it is false. So, we shade the opposite side of the line. The following videos shows how to graph linear inequalities. The following video shows an example of how to graph a linear inequality. Once we have learned how to graph linear inequalities, we can now learn how to graph systems of linear inequalities. We graph each inequality separately on the same set of axes. The overlapping shaded region represents the solution to the systems of linear inequalities. The following videos show examples of how to graph systems of linear inequalities.